We manufacture and export rare quality Pipe Banner, which come with very innovative and trendy embroidered designs and patterns. These pipe banners made from pure silk hence they are very durable. 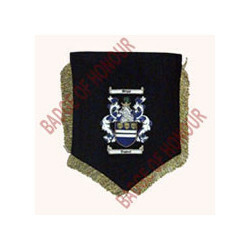 Avail from us, our embroidered pipe banners that are carved from high quality silk. The intricate designs can also be easily embroidered by us. 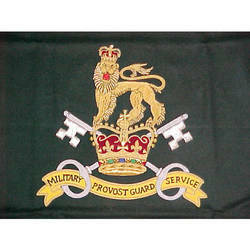 We are manufacturing & supplying Military Provost Guard Service Banner to our customers. Using very intricate embroidery, we have successfully been able to build a wide client who is quite diverse in their needs. 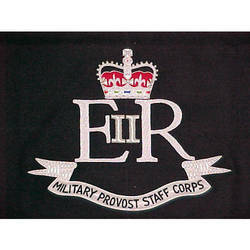 We are offering military provast staff corps banner to our customers. Learning from our experience we have always designed and manufactured our products using technically advanced machinery, which make these flawless in quality. 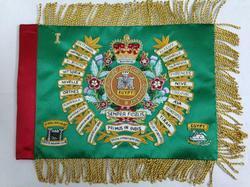 We are offering royal military police banner. 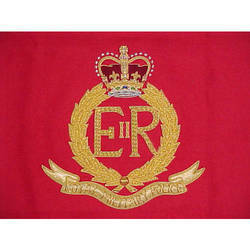 Our thread embroidered pipe banners available with us are known for their finish and designs. Unmatched in finish, these banners have exquisite embroidery done using silk threads. Looking for Pipe Banner ?